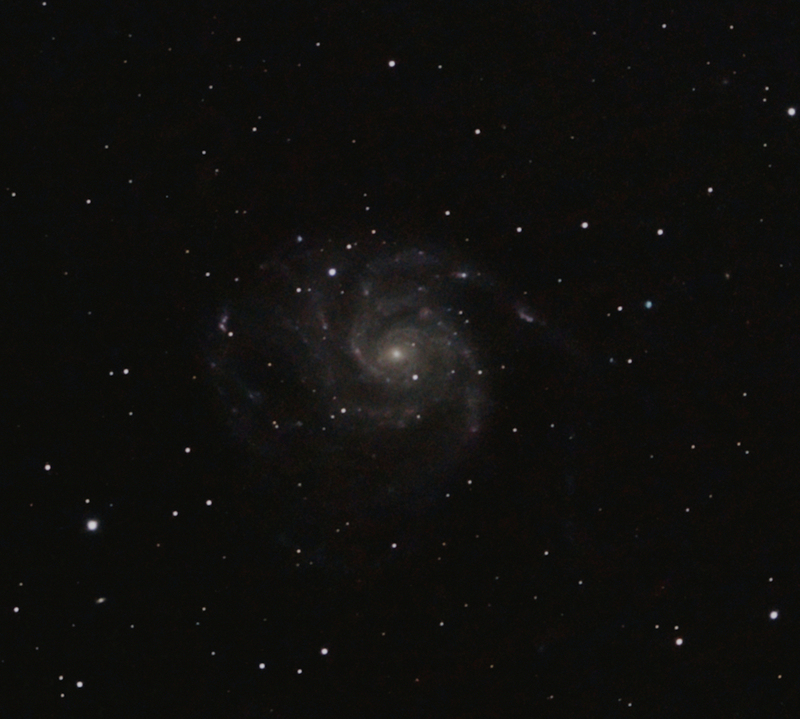 Here is a recent image of M101 taken with a Canon 60Da. The buttons below select before the supernova, the supernova at its brightest and the 60Da image in which the supernova is barely visible. The 60Da seems to be an excellent astrophography camera. It has much improved noise performance compared to the 350D, increased red sensitivity and an articulated LCD screen all well suited to deep sky photography. Daytime performance seems fine without the colour shift found in modified DSLR's. The images track improvements in both my technique and equipment. The before image was taken from dark skies, but has problems with focus as it was one of the first DSLR images I'd taken. The brightest image suffers from some optical problems with my Schmidt Newtonian telescope. The after image uses an eight inch SkyWatcher newtonian with excellent optics and a Canon 60Da camera. Processing for after image No calibration was done as the images were shot in jpeg mode with no in-camera noise reduction. The images were aligned and stacked in Images Plus. Several curve layers were used in Paint Shop Pro to stretch the image. Masked noise reduction was applied to reduce the noise. The remaining gradient was corrected using a layered technique in Paint Shop Pro.